M Enterijer Gradnja was founded in 2007 by Mr. Marko Ivic, a Bachelor of Science in Civil Engineering, who is also the owner of the company. In addition to engaging in building construction and civil engineering, the company profiled itself as a reliable partner in the construction of infrastructure, energy facilities, interior design and furnishing. The company has skilled personnel, its own equipment and machinery necessary for the execution of the most demanding works in the construction industry, trying to comply with the construction deadlines, construction quality and safety with the investor. M Enterijer Gradnja performs the most demanding works in accordance with the highest world standards. The leading team is perfecting, developing and growing together with new projects and challenges from day to day. The company employs over 100 employees today, including rebar fixers, carpenters, construction workers, masons, house painters, but also licensed civil engineers, Economics, Law and Architecture graduates. For carrying out the tasks regarding safety and health at work, the company hired 1 licensed person as well as 1 person for fire protection. In 2017, the company marked the 10th anniversary of its operations. In the following period, the highest priorities are in the area of improvement of cooperation with investors, suppliers, expansion to the foreign market, investments in employees, machines and other construction equipment with the aim of improving the business model. In addition to the rich experience gained in Serbia, the company has expanded its capacities so much that it can compete on a demanding European market and offer its customers the highest quality of services. The main goal of the company is to provide customers with top-class services in the field of construction. The vision is to make the life of people in Serbia more splendid through the realization of the largest construction projects. 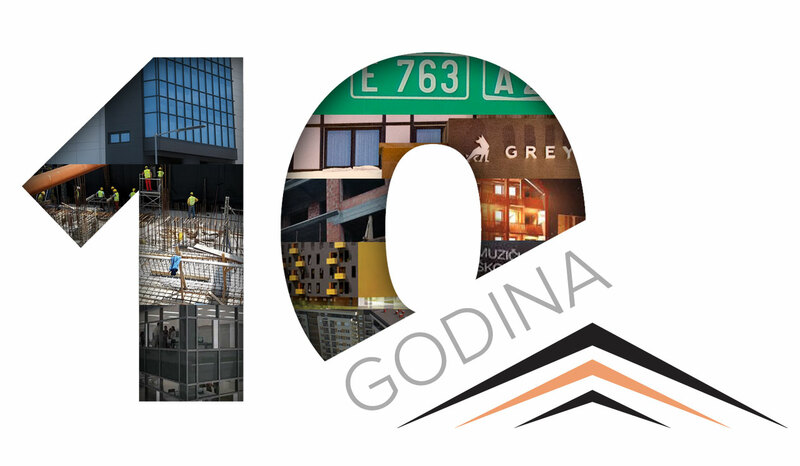 We strive to be a synonym for a company that constantly sets higher standards in the field of construction operations on the domestic and foreign markets. The mission is to provide clients with an experience that exceeds their expectations at every level, to be a reliable partner that guarantees continuity of delivery of services at all times, thanks to the references, professional staff and equipment that it owns.